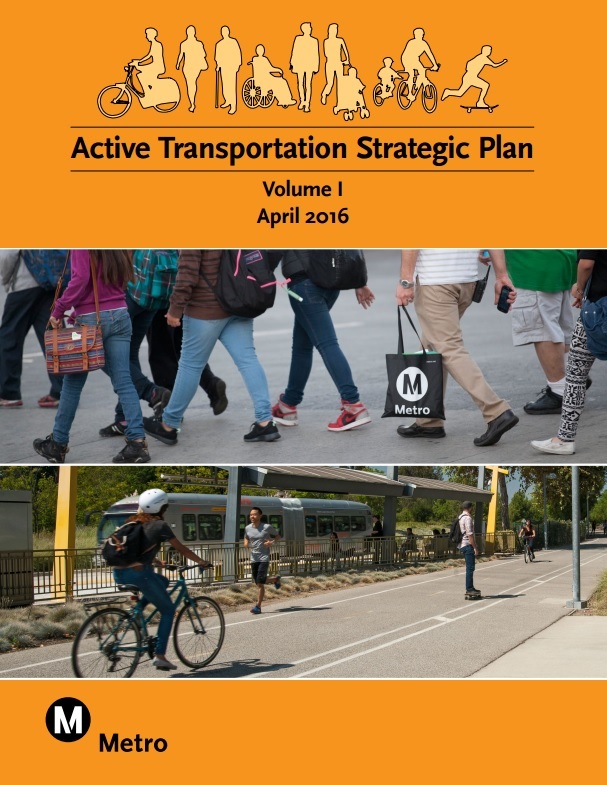 Will Metro pay attention to its own Active Transportation Strategic Plan [PDF]? Just when the Metro board was on the verge of adopting a policy to incorporate first/last mile, including bike and walk, connections into “the planning, design, and construction of all [Metro] transit projects,” Metro staff postponed including first/last mile connections to the second phase of Purple Line subway expansion. The issue before the board was Metro’s new Active Transportation Strategic Plan [PDF]. The ATSP theoretically builds on a number of Metro bike-and-walk-friendly policies, including the agency’s First/Last Mile Strategic Plan and Complete Streets Policy. Livability advocates, with champions on the Metro board prominently including Los Angeles City Councilmember Mike Bonin, have pushed for Metro to follow up these good-sounding policies with Metro funding commitments to truly get first/last mile facilities on the ground. After the 2014 passage of the Metro Complete Streets Policy, Bonin pushed the agency to follow up with a walk/bike funding plan. Metro dragged its heels on the funding plan, publishing schedules designed to complete the funding document right after the November sales tax ballot measure. So Metro would finally have a walk/bike funding plan right after it sets the course for the next 50 years of Metro funding. Pressure from Bonin and others accelerated the schedule for the funding plan, now called the ATSP. Today the Metro board approved its ATSP, a month in advance of June’s planned approval of a sales tax expenditure plan. The ATSP, similar to the plans that preceded it, also sounds good. There are plenty of graphs and diagrams about how great walking and bicycling are. What is new in the ATSP (page 59) is overall cost estimates for building out a Los Angeles County Active Transportation Network. There is no commitment on Metro’s part to pay these costs, but at least there is an official agency estimate for how much someone should pay to support active transportation. – These networks would be funded via the agency’s Long Range Transportation Plan, etc. – Metro would study and design First-Last Mile facilities for all Metro rail stations, all busway stations, all regional rail stations, and the top 100 ridership bus stops. Directors Butts, DuBois, Knabe and Solis put forth a motion adding to the above motion that local municipalities could count First-Last Mile projects toward their local match for rail projects. Currently local cities pay a three percent match for local rail construction. Under the Butts motion, if a city improves a sidewalk leading to a station, up to 50 percent of the cost of that project could count toward the local match. In committee last week, the match percentage was upped to 100 percent. Unfortunately, Metro staff had other ideas. As CEO Phil Washington explained at today’s meeting of the Metro board of directors, the agency already has a solicitation out for bids for constructing the Metro Purple Line Extension phase 2. Any modifications to the current solicitation would constitute a change order. Metro staff recommended that they study the fiscal impacts of “clause B6” and report back to the board next month. Even in the context of a multi-billion-dollar (perhaps $3-5 billion) subway construction project, Metro appears unwilling to commit to millions (perhaps $5-20 million) worth of walk and bike infrastructure. The final amounts need to be refined, but the cost of high quality walk and bike infrastructure is multiple orders of magnitude less than the rail infrastructure it would support. Five million dollars would go a long way to funding curb-ramps, bike-share, bike-parking, etc. within a mile or so of the two new Purple Line subway stops in Beverly Hills and Century City. The negotiation will continue to play out at June’s Metro board Planning and Programming Committee. Perhaps Metro will be able to incorporate these critical facilities into the Purple Line construction, or some kind of parallel construction process. Stay tuned.